Circulating and cerebrospinal fluid (CSF) neurofilament light chain (NfL) levels represent a reliable indicator of disease activity and axonal damage in different neuroinflammatory conditions. Recently, high CSF NfL levels have been detected in active autoimmune encephalitis, as opposed to significant lower levels after clinical improvement. The aim of the present study was to evaluate serum and CSF NfL concentration in patients with autoimmune encephalitis and to analyse the association between NfL levels and clinical, MRI, and CSF data. 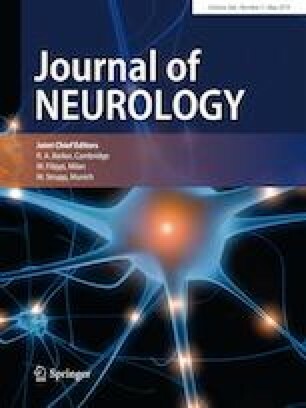 We retrospectively included 25 patients with neurological syndromes associated with autoantibodies to neuronal cell surface antigens and we collected clinical, MRI, CSF, and follow-up data. Using an ultrasensitive method (Simoa, Quanterix), we measured NfL levels in serum and CSF samples of all patients and in 25 sera of healthy controls. Serum NfL levels were higher in all cases, including 20 patients with inflammatory MRI/CSF features and 5 non-inflammatory cases (median 16.9 pg/ml, range 4.5–90) than in controls (median 6.9 pg/ml, range 2.7–12.8; p < 0.001). A correlation between serum and CSF NfL levels was found (r = 0.461, p = 0.023), whereas no significant association was observed between NfL levels and clinical, MRI/CSF inflammatory burden, and antibody type. In the 13 available follow-up samples, correlation between disease activity and NfL values was also observed. In conclusion, NfL levels are significantly increased in the serum of patients with antibody-mediated encephalitis, independently of the MRI/CSF inflammatory profile. These findings support the presence of ongoing axonal damage and suggest the co-occurrence of different mechanisms for neuronal/axonal involvement in antibody-associated CNS syndromes. Sara Mariotto and Alberto Gajofatto equally contributed to the study. This work was supported by the Ministry of Health (RF-2011-0234-7955). Sa.Ma. was sponsored by Merck for attending a scientific meeting. AG received research support funding from Merck. Sa.Mo. received honoraria from Biogen. S.F. was sponsored by Shire for attending a scientific meeting. The other authors declare that they have no conflict of interest. All human studies have been performed in accordance with the ethical standards laid down in the 1964 declaration of Helsinki and its later amendments. We collected consented to diagnostic procedures and biological sample storage at the referring laboratory for research use from all patients or legal representatives.